2. 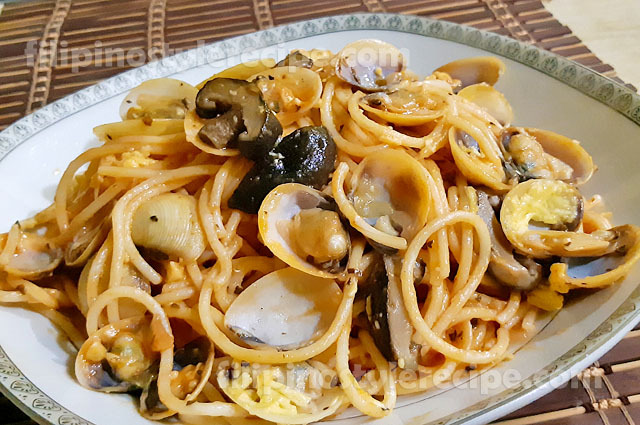 In a same pan, add clams then cover and simmer until shells open. 3. Add three cheese pasta sauce and grated cheese then keep stirring for about 3 minutes. 5. 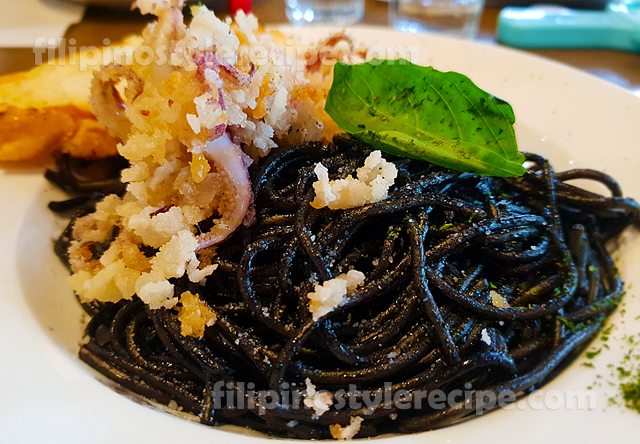 In a serving plate, arrange pasta then add the sauce on top. Sprinkle with remaining grated cheese and garnish with parsley. Serve! 1. In a pan, combine sauce mixture then simmer until thicken. Set aside. 1. Season scallops with sugar, salt and pepper. 2.In a pan, heat oil then melt butter. 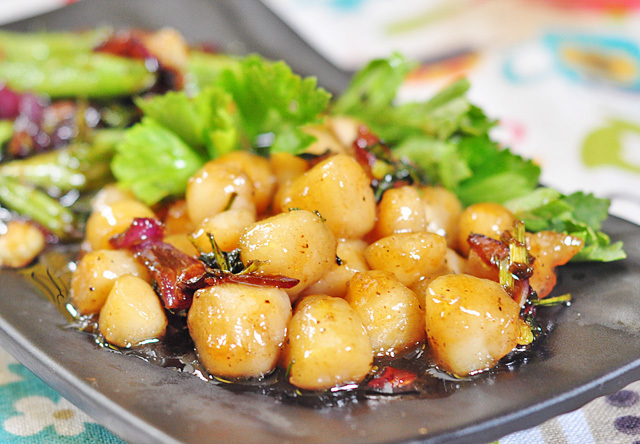 Add scallops then cook until brown and caramelize. Set aside. 1. In a same pan, saute garlic, onion and parsley. Add oil and butter if necessary. 2. Add green beans then stir cook for 3-5 minutes. Season with salt and pepper. 1. Transfer scallops and green beans into a serving plate then drizzle with thicken sauce. 2. 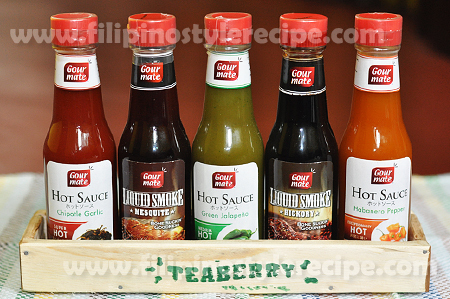 Garnish with remaining parsley. Serve. 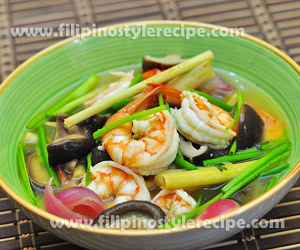 Filipino Style Recipe: Tom Yam or Thai Prawn Soup is a popular Thai soup dish. 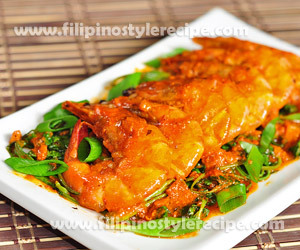 It consists of shrimps with lemon, fish sauce and some herbs and spices. I love tom yum soup but the only way to have it is in thai restaurants and usually, they are a bit pricey.While I was in the grocery I passed by this aisle with premixes and I decided to try one of the tom yum instant mix. 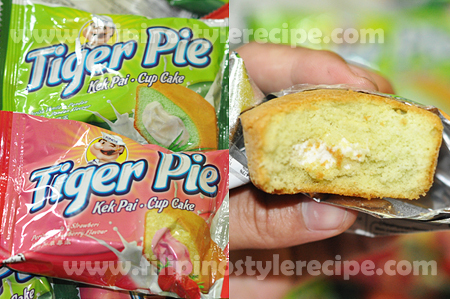 I just added some of the ingredients to enhance the flavors and tadaaa! I have my budget friendly tom yum soup. 1. Put the shrimp head in boiling water and let it boil for 5 minutes to release the flavor. Strain the shrimp head out of the boiling water. 2. Add onions, ginger, mushroom, and lemon grass and let it boil for 3 minutes. 3. 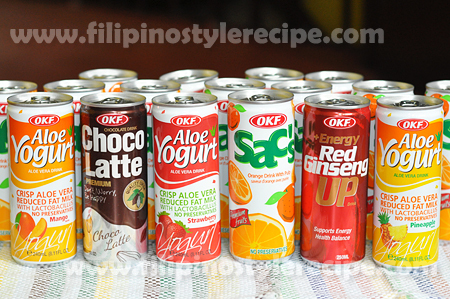 Add the tom yum soup mix. 4. Add the shimp and cook until color turns bright orange, around 3 minutes.Season with fish sauce. 5. Remove and transfer to serving bowl. Top with spring onions. 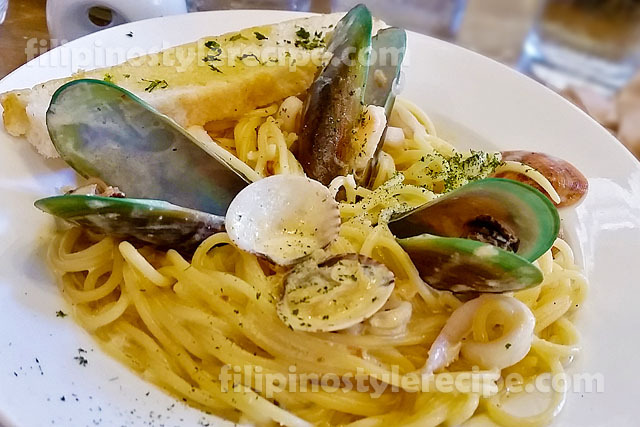 Filipino Style Recipe: Spicy Shrimp Aligue is a simple yet mouth-watering seafood dish. The dish is consisting of shrimp cooked in crab fat (aligue), hot sauce, chili flakes, lemon juice. Serve with kangkong. 1. In a pan, heat oil then sauce garlic. 2. Add shrimps then stir fry until color turns to orange. 3. Add aligue, hot sauce and lemon juice then simmer for a minute. 4. Pour water, chili flakes, fish sauce and grind pepper then cook for another minute. 5. Add kangkong and cook until wilted. 1. In a serving plate, place wilted kangkong then place shrimps and sauce on top. 2. Garnish with remaining onion leeks. Serve. 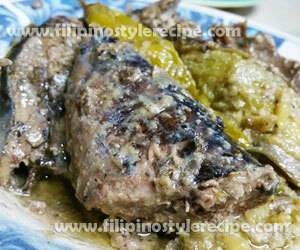 Filipino Style Recipe: Skipjack Tuna in Coconut Milk is another simple and easy Filipino dish. 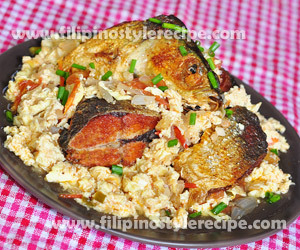 It is usually consist of skipjack tuna (tulingan) cooked in a combination of coconut milk, vinegar and some spices. 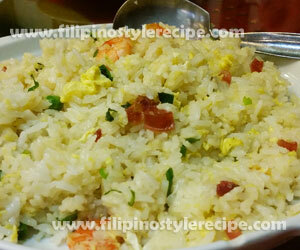 Filipino Style Recipe: Easy fried rice is a simple way to cook left-over rice. 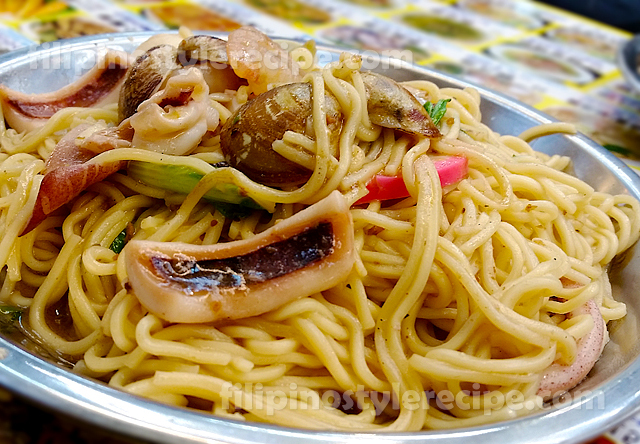 This dish is commonly served during breakfast together with other dish. Fried rice is made up of leftover rice stir fried with shrimps, scrambled eggs, sausages, peas, carrots and other vegetables. 1. In the pan, heat oil then stir fry sausages for a minute. 4. Add cooked rice and soy sauce then mix until rice is well coated. 7. Transfer to serving plate and garnish with chopped spring onions.